This unique group, called Cleveland Independents, is a group of around 90 independent and locally-owned restaurants that work together to promote their businesses and impetus for locavore lifestyles. Cleveland Independents is Cleveland’s version of EatDenver in Colorado or Louisville Original in Kentucky, to name a few. Kudos to the group for not only inspiring people to support Cleveland’s local economy and small businesses, but also for facilitating eating local in meals that go beyond our own kitchens. Navigating Cleveland Independents’ website (http://www.clevelandindependents.com/), you are given the option of four main categories from the homepage: About Us, Restaurants, Events, and Shop. The About Us page reiterates the incentives of the Cleveland Independents group and its support of northeast Ohio. An option is also given to sign up to become a member restaurant. For those already a member, a log-in widget is available on the sidebar. The Restaurants tab provides an alphabetical listing of its members, their addresses, phone numbers, gluten-free availability, and reservation links, if such a mean exists for that restaurant. Many of these restaurants I have written about under my “Restaurants” tab; the ones I haven’t are ones I intend to visit! Next, the Events tab is a brimming list of specials, wine tastings, parties, and anything else you can imagine that is happening at these various locations. One of these events is the Cleveland Restaurant Week, which I will feature next in my “Green Initiatives” category. 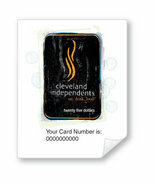 Finally, the Shop tab enables users to buy gift cards and gift certificates to the “Cleveland Independents” as a whole. What better way to promote local eating than to enable selling gift cards that can apply to any of these places? This is an example of the kinds of cards that can be ordered from the website. If you’re from Cleveland or just visiting, check these restaurants out! And if you’re into local food as much as I am, consider it a must for any Cleveland-dweller to dedicate themselves to these places whenever looking for a place to eat!